Create lasting memories with a Pool Party at Blue Buoy! 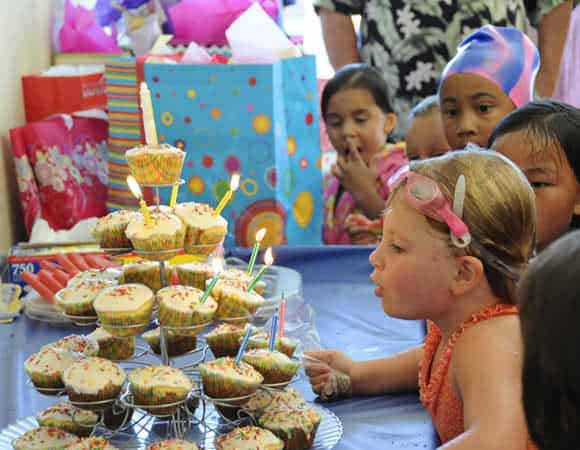 If you are wondering what to do for your next birthday or special event, call and ask about our fantastic pool parties! You will have use of the entire Blue Buoy Facility. It’s like having a party in your back yard or a country club, without the cleanup. A very different environment from being pushed from a play room to a cake room with another party right behind you! Pool party rental includes lifeguards for up to 20 guests under the age of 18. Adults are always welcome to get in the water too. Most parties are two hours, but longer rentals and larger parties can be arranged. Parties are typically scheduled: Fridays 5:30-7:30pm, Saturdays 2:30-4:30pm, and Sundays 11am-1pm, or 2-4pm. Call our scheduling office at 714.832.8910 for available times, fun party game ideas, and options including adding Bubble Rollers to your party. If you’re currently enrolled in lessons, make sure you ask about Blue Buoy student discounts! Introducing a fun addition to any party … Bubble Rollers. Let us know if we can add this fun option to your next pool party. Aqua Balls are designed for you to walk or float on water, walking inside the sphere. You can run, walk, skip, jump, roll and float on water. It’s so much fun!